Paxton 1964-1968 Carb Mustang (Driver Side) N1200SL Polished [1001840SL-P] : Supercharger Superstore, Your Online Source for Vortech Superchargers, Paxton Superchargers, Procharger Superchargers, Magnacharger Superchargers and Techco Superchargers! As a tribute to the Paxton supercharged Shelby GT-350s of the '60s, we offer current systems for V8 powered carbureted Ford Mustangs designed to fit under the stock hood. With a horsepower increase ranging from 30% to more than 75% (depending on engine build), the new gear-driven, nearly silent NOVI-1200 or NOVI-1500 supercharger will provide street superiority. A cast aluminum carburetor enclosure assembly for the use with Holley #4150 type, Quick Fuel Q-750 BAN or Demon 650 MD 4-BBL carburetor (mechanical secondaries, .120 needle and seat plus nitrophyll float set). The enclosure pressurizes the float bowls and throttle shafts for seamless response and correct air/fuel ratio. It features front and rear -8 AN fuel inlet ports as well as multiple locations for pressure/vacuum connections. Linkage arms, splined shaft and left/right hand spherical rod ends are included for simple throttle connection and adjustment. Carburetor studs are supplied and available separately. If the Holley carburetor is used, an air diffuser (#8M011-001) is recommended. The NOVI supercharger uses a 3.7" 8-rib supercharger pulley, which produces approximately 7-1/2 PSI @ 5500 rpm on a stock V8 engine. Billet aluminum mounting plate configuration for alternator and supercharger drive assembly. Aluminum discharge tube with Bosch compressor bypass valve. Fuel system upgrade with high-volume boost-referenced mechanical fuel pump, fuel filter, fuel lines and high-flow air filter. Factory stock compression ratio is recommended. 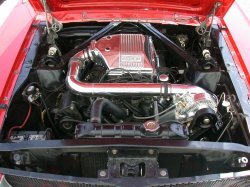 If other than the factory (standard rise) manifold is used a cowl hood may be necessary. Not compatible with generator equipped vehicles. Throttle linkage compatible with 1964-68 Mustang only (other vehicles/years will need custom throttle linkage construction). Carburetor enclosure is compatible with "small" diameter distributor cap only. Supplied air filter may interfere with some valve covers. Not compatible with power steering pump mounting. Not compatible with air conditioning. Requires battery relocation in 1964-68 Mustangs & 1963-65 Falcon/Comet. Supplied alternator spacer works with Ford alternators only (3” mounting shoulder). Chevy alternator requires custom spacers. Our system is best suited for H-Code cars that have 2-BBL carburation and a 9.5 to 1 compression ratio (dished top pistons) from the factory. Boost will be limited on M-Code cars with 10.7 to 1 compression (flat top pistons).